I watched a documentary years ago (my apologies, I do not recall the name) that touched on signs of the Noah's Ark. Is there even a shred of evidence indicating the stories discussed in the bible are true? 1 2 3 - Physics is for me! Noah's ark appears to be pure myth. There were some papers a few years ago which suggested an origin for the flood stories in the middle east. The idea was that until about 7500 years ago the body of water now known as the Black Sea was a fresh water lake with its surface substantially below sea level. The Bosporus at that time was closed. About the time in question water from the Mediterranean broke through and the lake level rose very rapidly to sea level, flooding all settlements near the old lake. Presumably some people managed to escape and the story of their escape became the basis for the flood stories. Occam's Razor says that the simplest explanation is the most likely to be correct. The simplest explanation for the bible stories is that they are just myths. For example : no-one has ever found any ancient Egyptian record of Moses and the Jewish people as slaves in Egypt, or the plagues. If the first born child of every Egyptian family had really been killed, this would have been massively vital to the Egyptian people, and should have been recorded. Apparently it was not. So it is probable that there never was an interlude when the ancestors of the Jews were slaves in Egypt. In the same way, Noah's flood probably never happened. There is kind of a turning point in the Bible where it starts to become real, verifyable, history, right around 600-700 BC when Persia conquered them. Cyrus letting them return to their homeland is verifyable in Persian records as well, if I'm not mistaken. In the earliest books, all you've got is oral history that somebody went and decided to write down. And sometimes oral history, um, .... augments the truth a bit. Now in Glendale AZ but formerly from Elkhorn WI, just outside Milwaukee. Yeah. 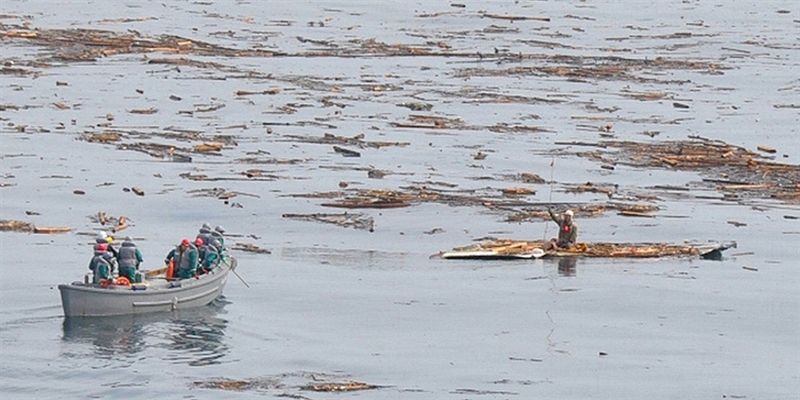 Can well imagine some poor fisherman gets washed out to sea with his family and some friends. Every direction he looks there's water out to the horizon. After a while he's fortunate enough to make land fall, and he thinks that's because the rain waters have lowered enough for some land to become visible. Even better, if he lands in a place that doesn't already have people living in it, he might think he's alone. The Ark was 450 feet long, 75 feet wide, and 45 feet high, constructed from "gopher wood". I find it unlikely that a single man and his family could create such a massive vessel without any of today's technology. Also how could he fit all the land animals in? It is interesting to note that none of the Bible literalists has ever actually built an Arc according to the bible discription to prove that it is possible. I have heard that one group started out to attempt that and found that they could not make it hold together without steel beams. They changed the "boat' into a building and the result is now a theam park in the south east US somewhere. KALSTER and westwind like this. Well, the ark has been built. and completed, by simple tools, by 1 man and his family. At skeptic's comment. I'll touch a vile subject as well, again about the jews, apart from no records about enslavement in egypt, there are no records about the gas chambers, including not a single one ever found, same with the gas, or their containers. Including that much of the deathtoll has been highly exaggerated. As from the netherlands, more jews were seemingly deported then were actually registered. Much more. History is written by the victors. Isn't it strange that every "good" guy won the war. That the north of the US beat the south. That england was extorting etc etc.. I wished everyone could write at that time, and keep journals. Now all we can read is ancient propaganda. Sorry it wasn't. They used modern tools--he's a contractor; it appears not to really be floating (no boats can more than about 250' without metal reinforcement because wood can't support hogging; it's not a boat at all but supported by the barge, and only one eighth the bible volume. I'm going to assume that "victors" in this case would be the writers the Exodus account. Within the narrative of the Exodus the Pharaoh's name is never mentioned, which is a odd detail to be excluded given all the direct communication Moses had with him. It is odd that millions that fled Egypt, no one knew his name only his title. As this compares to the Destruction of the European Jews by the Nazi regime, we would have reports of death, gas chambers, and combat operations in the European Theater of World War II yet no one ever mentions the Chancellor of Germany name. Zwolver, do you have any evidence for your claims about the gas chambers and the number of Jews deported? The Wikipedia article has some pictures of gas canisters and ruins of a gas chamber. Last edited by Harold14370; June 29th, 2012 at 05:00 PM. There was the Ararat anomaly. I wonder what the current status on that is; I can't find any reliable sources on it. I heard it turned out to be just a giant rock. Yup. There was a tv doco on the other night about the various expeditions and searches. And the 'anomaly' that was spotted was a rock. Talk about wishful thinking and confirmation bias. It was obvious (to us) what it was when they did the flyover - apparently someone spotted it from a plane 50+ years ago - and then when they walked over the area it was even more obvious. Ah, I thought so. Would it surprise me if a stubborn Christian thought "My goodness... Noah's Ark was made out of rock!". It might as well be, since "gopher wood" doesn't refer to any known materials. the story of the flood was told and retold and retold for 400 generations from the time of the rapidly rising sea levels at the end of the ice age? And, the story changed over time as did every story that has been documented. Assuming that we had seafaring people back then(a concept rapidly gaining acceptance from the anthropology/archaeology community) it is a small step to imagining that some people took to their boats, and rode out the "flood", landing on what had once been an inland mountain, saving their family and farm (male and female) animals in the process. There is another very old flood story found in the ‘Epic of Gilgamesh’ poems. I understand the poems were written before the Moses account of a big flood (by 700 years?). I’m no expert on the subject but the similarities of both stories are interestingly close, well known by scholars and have been debated before. Jump to the ‘Great Flood’ title. IIRC there are about 500 or 600 of these epic flood stories identified throughout Asia, Middle East and Europe by anthropologists. Not surprising when you think how likely it was that small groups of people would have established themselves on riverbanks or seashores - the most productive environments available were also the most likely to experience floods. Or there could've been a flood with a range wide enough for several cultures to witness, thus each making its own verbal account passing through generations and changing constantly. And, the only one I can think of would have been the rapid sea level rise at the end of the last glaciation cycle, inundating whole civilizations. Yeah, that's definitely possible. I also saw a History Channel program assessing the possibilities. It mentioned some particular tectonic event that caused some water body to flood into a valley, in the area of SW Asia. If it was a real flood, it must've been either these two. Umm, do we have statistical data on how fast the sea level rise was? I doubt it was fast enough to be translated into a flood story. trouble is, there is no consensus as to the speed of flooding from the melt. Common (recent) belief has several melt water pulses(mwp), some of which were more sudden, on the order of 2-6 meters/century. There may still be some negative(conservative)bias in the numbers, because until recently, the glaciers were assumed to have melted over thousands of years, and now, some are proposing just decades for the melt. one estimate: "Previous studies of sea-level change at individual locations have suggested that the gradual rise may have been marked by abrupt 'jumps' of sea-level rise at rates that approached 5 metres per century" and more in some instances, averaging 6 meters per century. with more rapid pulses within those averages----maybe from rapid discharge from vast glacial lakes (eg. lake boneville emptying down the snake river in a matter of days or weeks, or lakes agassiz and ojibway releasing 105 cubic kilometers in less than a few years). A typical disclaimer would read: "uncertainties in fossil dating, scarcity of sea-level markers, and the specific characteristics of individual sites can make it difficult to reconstruct global sea level with a high degree of confidence"
Assuming the melt over decades model gains support, the changes would fit the above flood speculation---------but that is a guess. Add in the likelyhood of storm surges in a changing climate, and surges from rapid discharge of glacial lakes, and maybe we got a good candidate.? Me too. Inches per year at the most. Enough to notice over a generation, but not enough that people couldn't easily move out of the way unless they lived in an island. Land floods however are easily broad enough and powerful to sweep away entire tribes and even city states--a level of destruction often sufficient to destroy an early civilizations or set them up for destruction by an enemy. I think this is probably why so flood stories are so common around the world--the most desirable lands for agriculture and city building are also the most vulnerable to flooding. Something as simple as some dude with his family and two lambs managed to survive a flood by floating on his grass roof down a devastating torrent could have been the grain behind the entire myth. Correct, 45 feet roughly equals the stated "30 cubits". A cubit is the span from fingertip to elbow. There's a jarring contradiction in the text where is said, "Fifteen cubits upward did the waters prevail; and the mountains were covered." This line is certainly written by different authors, with different views. There's another way they could have honestly derived their flood theory: archeology in prehistory. Archeology has existed since humans could dig. For example lately we've discovered towns submerged 10m off the coast of Isreal - these ruins were certainly once visible at low tide, and people then as now would have speculated and drawn conclusions. Seems like a very far fetched association, especially given the first hand nature of the stories and the disparate locations in which the stories are found. You mean when these ruins were only partially submerged, people wouldn't have believed a theory for them told in first-person narrative? Maybe you didn't get my main point: that the ruins now completely submerged would be obvious curiosities when they were partially submerged. They also would have been more complete and numerous. It follows that people would want some explanation. A flood story seems appropriate. We know that flooding was mostly incremental, with settlements shuffling to higher land as old neighbourhoods appeared to sink beneath the waves. A less informed person in the midst of this progression might suppose the flooding had been rapid and catastrophic. Wouldn't such common observation appear as proof the world had flooded? Or even inspire the myth in the first place? When I see people getting all excited about the potential for a 1/3 meter rise in sea level over the next century, I extrapolate backward to contemplating sea level rises 6-12 times faster than that circa 8-14 kybp, and know that if some of my contemporaries are excited by the current trend, it would be likely that our ancestors were 12 times more anxious by their little disaster. This all hinges on my, not commonly shared, concept that our ancestors had rather well developed civilizations at waters edge circa 8-14-40kybp. supported by 40kybp deep sea fishing, and the oldest gobleki tepi "temple" (circa 12kybp)"was the best constructed" signifying a carry-over from a previous civilization and other less obvious hints. (one of my degrees was in archaeology) and the indications were obvious to me because of my predispositions. OK all that is really a stretch, and is just an alternate to trying to explain away adelady's 500-600 like stories with 500 to 600 different disasters. Without good cheap underwater archaeology at 140 meters under the waves, it must needs remain idle speculation. Do the stories stem from a common event? Or are they isolated incidences from disperate cultures, times, and locations? 500-600 like stories with 500 to 600 different disasters. Oh dear. Now I have to scrub out the old memory saucepan to see if it's still useful. I think anthropologists would say that there's huge overlap in those stories. Remember we have isolated communities which are very prone to coming up with dialects and completely new languages. Add to that the idea that these are either rivers or large seas flooding. One reasonably long, wide river with an extensive flood can have a nice new flood story every 50 km or so - esp if the communities are on opposite sides of the river and don't trade much. What cultures are you referencing as the producers of ruins that would have been submerged? The ice age ended at the start of the Mesolithic with most( all??) cultures at that time being hunter-gatherer or small scale settlements. The slow progression of the sea level rise wound NOT have generated flood stories that match the stories being discussed. What cultures are you referencing as the producers of ruins that would have been submerged? You understand the remains of humans living at sea level are mostly obliterated, so you're kinda like asking for harpoon points of Arctic Ocean Inuit. We know that historically most humans have lived near sea level, so we should assume this also true of prehistory. The Atlit site is a good example. There is a pre-bronze village accessible to divers, then higher up a submerged Phoenician port, then a Crusader fortress threatened by our latest sea level rise. We know that stone has been taken from the old fortress, for later constructions. Deconstruction of ruins was common, so unfortunately most sites have been diminished if not obliterated by humans. We should assume this increasingly true, the older the site. The slow progression of the sea level rise wound NOT have generated flood stories that match the stories being discussed. We can't say for certain, because we're guessing what prehistoric people thought when they observed remains of earlier civilizations flooded by the sea. I guess they thought "floods happen" or perhaps (silly) thought people lived underwater. I can't see how they'd determine the rate of flooding had been 1-2cm/yr , or that they'd find that calculation very exciting. The simplest explanation to naive observers is that the sea just "rose a lot". Then a shaman chimes in to tell why. The fastest sea level rise rates are at most 5 1/2 per year at most. Most of the time it was much less then that. These are not rates that would lend themselves to "world destroying flood that only our small tribe survived" stories. The fastest sea level rise rates are at most 5 1/2 per year at most. Okay, travel back in time to educate people of that, when they're wondering how buildings of a forgotten civilization got underwater. Your argument depends on prehistoric people having your own informed understanding of geologic timescales. Mine depends on prehistoric people reaching the conclusion simplest from their point of view. 1) Fishing in a lake, you snag a human hand, an entire corpse with rope around its neck. Do you call an archaeologist, or call the police? 2) Hiking on a glacier, you encounter a thawing bear. When did the bear die? 3) Later you find a seashell in the mountains. How did the shell get there? How do you know? What is the simplest explanation? The fastest sea level rise rates are at most 5 1/2 per year at most. ... .
You do not know that. You can not know that! Ask any paleoclimatologist worth his/her salt, exactly what was the sea level rise between say 11,410 years bc and 11,390 years bc, and you'll get the same answer "We do not know". Most estimates come from indirect estimates via examining things like coral beds. And, the timeframe for these changes is also an estimate, and varies greatly from one site to another. We can come up with average rates over centuries, but averages do not tell the story in detail. They are just averages, for example, if the average life expectancy in a community is 65 years, you will have some infant deaths, and some folks living into their 90s. "Sometimes ice meltwater would pile up behind an ice dam and when the dam collapsed a huge flow would follow. One such great flood occurred in the American northwest 13,500 years ago when an ice dam holding back about 2000 cubic kilometers of ice meltwater (Lake Missoula) collapsed. A huge mass of muddy water and debris rushed across the area into the Columbia River, cutting broad channels called coulees and forming the so-called Channelled Scabland…As a result of the flood that formed the Scabland, the sea-level rose very rapidly, from minus 100 to minus 80 meters." When I was a student, any discussion of humans in the americas pre clovice was assumed to be from "the lunatic fringe". No longer true. And the "ice free corridor" was assumed to be the only means of entering the americas(though there is no archaelological evidence for such a corridor) and that also is no longer assumed to be accurate. We guess, we look, and if we are really lucky, we look where we can find something that clarifies the knowledge base------eg, the pot belly hill---Gobekli Tepe---monument building indicating civilization well before "the agricultural revolution". Before that, any mention of civilization predating the "agricultural revolution" was assumed to be from the lunatic fringe, and just "wrong". Now, we re-examine the old construct in light of new evidence. There are no absolutes in archaeology, just educated guesses based on shared knowledge. To (mis? )quote Samuelson's phrase attributed to Keynes, "When the facts change, I change my mind---what do you do sir"
other floods may have caused sea level rises of up to 20 meters in a matter of weeks. The estimated rise was much less than half a meter. Also the current models are giving us a pretty good idea of maximum rates of possible sea level rise--on the order of less than 10m a century. There just isn't enough energy in the system to melt the cryosphere any faster. It's enough to catastrophically reflood below sea level lakes of course, but outside those basins and downstream meltwater plains, slow enough to easily get out of the way. One caveat, it seems that "isolated communities" were the exception, not the norm. ... The estimated rise was much less than half a meter. Drumlins, subglacial meltwater floods, and ocean responses ... . The rate of sea level rise slowed between 14,000 and 12,000 years ago during the Younger Dryas cold period and was succeeded by another surge, "meltwater pulse 1B", 11,500-11,000 years ago, when sea level may have jumped by 28m. = average of just under 6m/century. Out of the dozens of identified glacial lakes, is it not likely that several would drain within days, weeks, months, or years of each other. Into this mix, we should also add increased vulcanism, increased earthquakes(from isostatic rebound) and the likely exceptionally strong storms that accompanied the radical climate change when going from a period of glaciation to the current interglacial. but, for the sake of this discussion i have chosen to tie some threads together from what might well be called "the lunatic fringe" with a sprinkling of some hard science from places like gobekli tepe, and more mainstream guesses from nasa, etc. Remember, that much of todays mainstream science was once derided as lunacy, everything from continental drift to ice ages all flew in the face of "current models". (which I have previously derided as "the scientific dogma du jour"). There are myriad pieces to this puzzle, some of which we have found, some of which we are guessing at, some of which we may never find, and some of which we ignore, or have stuck in the wrong damned place. Last edited by sculptor; July 11th, 2012 at 04:52 PM. There's no need for ice to melt to affect sea level. It only needs to be released from its fixed land base and slide into the water. The sea level will rise instantly, but not where you might expect. The ice can float around and melt at whatever rate happens to apply on any day. The damage is already done. You're right (shame on me). But lets do the back of the envelope math for lake Missoula, which we estimate at 2100 km^3 compared to the size of the oceans. ~300,258,000 km^2, and you can see it's much much less than a meter rise. We need dozens of such events releasing their melt simultaneously to see a civilization ending event due to sea level rise unless you happen to be in the way of one of the outburst. Thanks for the submerged reef links, it's really fascinating material. To determine the pace of sea-level rise in that period, Dr. Blanchon charted patterns of coral beds. He said his work revealed a clear point where an existing reef died as the sea rose too fast for coral organisms to build their foundation up toward the sea surface. Once the sea level stabilized again, the same group of corals grew once more, but farther inland and up to 10 feet higher in elevation, a process known to geologists as backstepping. Such an abrupt change from stable coral growth to death and a sudden upward and inland shift of a reef could only happen because of a sudden change in sea level. and, curiously enough, that fits the suggested timeframe for the filling of the black sea-----step by step higher seas = higher meditteranean then spill over into the black sea? One event triggering another and another=one event = many events = one story=many stories? Good find Sculptor. I think we're well past Noah's flood though, catastrophic is greater than a 45mm/year...or just shy of 2" for us US types. Certainly a walking rather than a running event to escape. I can certainly imagine one of my ancestors though, my age which would be rather aged for his time, knowing the beach he collected clams on as a kid is now gone along with the village his dad lived his life in. Last edited by Lynx_Fox; July 12th, 2012 at 12:05 AM. Amazing that we actually read the same paper and have such different understandings. What I got out of it is above 45mm/yr no corrals can keep up and grow fast enough to keep up with sea level rise. If sea level continues to more than 5m, than that corral dies. The study documents at least three episodes where that 5m were eventually exceeded and completely new reefs had to be established in shallower waters, those are the 3 CREs shown in figure 3. Table 1 list some of the mega releases of melt water known at the time of the studies wich correspond to the observed CMEs. I'm going to look up the authors to see if they've continued to refine their work over the past 15 years. The great flood was not because of rain, it was because of a glacier cracking and releasing massive amounts of melting water from mountains and ex-permafrost leftovers from the last iceage. there were 3 pulses that exceeded 5 meters " instantaniously" (fast enough to kill the coarl beds which likely means well under a decade). Coincidentality(?) one was approximately near the time of the "first" "temple" at gobleki tepe(CRE 2, 7.5m rise at 11.5ka), and the more recent one about the time of the flooding of the black sea(CRE3, 6.5m rise at 7.6ka), with a third(the first)(CRE1, of 13.5m rise at 14.2ka). Each of which would have drowned seashore communities within a generation. Could the inhabitants have walked away? Even if they could have done so, to see your monuments and buildings forever lost below the waves wouldn't have left the people involved with no emotional/memory effect/affect. And, now Hansen is still claiming a possible 5 meter rise by the end of the century. If the math works for him without the more massive discharge of the great landed ice sheets, it seems that we should not discount the same when there was so much more available then. So the earlier postulated "what if" seems more possible now? Anyone here up on the vulcanism of those times? Or up on earthquakes(and how would you go about timing ancient earthquakes?)? Or over a ~century (111 years at 45mm/yr=5m), which is still completely consistent with their results. "Instantly" is from the perspective of geological time. I think that most likely possibility is still myth based on land-based river flooding--the rain, massive inundation over a short time and live destroying destruction all fit a lot better than some dude watching his island community disappear over the course of years. Hanson's ideas of 5m are at the extreme end of recent models and it's not anywhere close to his expertise so I think it's more an opinion than an expert opinion. I'm interested to see what the IPCC comes up with this time around--their 2007 report wich suggested only about a meter rise looked too conservative even by 2008. Or over a ~century (111 years at 45mm/yr=5m), which is still completely consistent with their results. "Instantly" is from the perspective of geological time. . I think you err in taking the gross numbers and choosing to view only the average as though the only possible outcome would be a linear one. Look at Blanchon's data for pulsed surges in sea level rise. Look at the world around you and see if you see pulses, or a linear progression. Look at how hansen derives his predictions, and you will see that his math is not linear, but exponential. Linearity is a construct of the mind, and not a normal function of nature. Look with your eyes, and all your senses, and look with your very soul, and not only with your mind. is still focusing on one event, and not adelady's posted hundreds of stories. Perhaps you should think on a broader scale? When we talk about flood(s), I do not necessarily assume a wall of water washing everything in it's path away. A steadily rising sea would have the effect of displacing a civilization. And one that rose enough in a generation to cover a village, and/or monumental architecture and never receeded, would/could have the effect of permanently dislodging the foundations and basis for the civilization, and scattering it's survivors into smaller population pockets who may remember and tell the stories of the loss of the previous seaside paradise quite differently. Looking at the evidence of gobleki tepe, i think it folly to assume that that was the very first monumental architecture. If I am correct, wherethen should we look for it's predecessors? Under the waves? Last edited by sculptor; July 12th, 2012 at 12:54 PM. their 2007 report wich suggested only about a meter rise looked too conservative even by 2008. They even said it was wrong at the time. They excluded any contribution to SLR from icesheets because there were no reliable/conclusive/verified scientific observations or papers they could rely on to put a number on it - not even a number with gigantic error bars. The next report will certainly have a number or two - and Hansen's 5 metres will be included in those error bars. 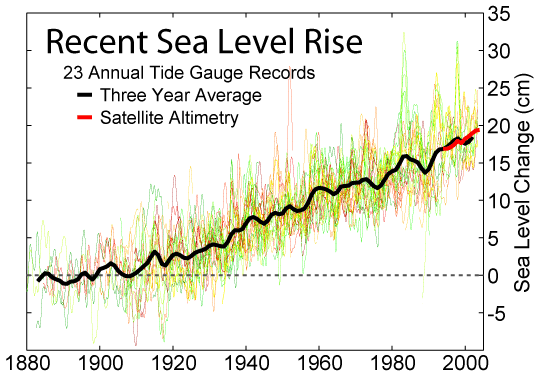 Hansen's five metre rise is based on a doubling of rate of sea level rise every decade. I am most skeptical of this, since we have had almost steady sea level rate of increase for for the past almost 100 years. That is : roughly 2 mm per year global average, with no sign of any increase apart from normal fluctuations up and down. roughly 2 mm per year global average, with no sign of any increase apart from normal fluctuations up and down. A lot of cultures speak of a great flood occuring at some point. The Epic of Gilgamesh (which is one of the oldest known written pieces) has similar parallels - though it is meant to be just a story. A very long time ago I watched an hour long special (either on Discovery or National Geo), I specifically recall it stating a belief that an event that would've caused a great deal of flooding around the Black Sea being the source of these stories. Or maybe a 'great flood' is some sort of trope that is ingrained in the human psyche? By and large, i discount the words of people who ignore history and over use words like disaster. We should all expect the climate to repeat what it has already done, time and time again. Anything else bespeaks that which I do not like in my fellow creatures with reasonable intellects. If/when(?) i'm ever done building my house and greenhouse( sculptor's albums - Imgur). I have long wanted to build a viking type boat out of riven oak. Should I succeed, I'll be damned if i'd want to share it with 2 fleas, 2 rats, 2 bedbugs, 2 cockroaches, etc.etc. .
define please "a bit crook"
does anyone have a link to show if the rain belts are moving to new (higher latitude) areas? Last edited by sculptor; July 13th, 2012 at 09:54 AM. There is some research comparing observed growth of the Hadley cells and model simulations of climate warming both of which move Ferrel cell rainfall to higher latitudes. Coughing badly. Had a superlative example of the species deathly sinus headache when I woke up the other day. Moved right on to coughing and coughing and coughing and coughing. Now have an outstanding case of aching diaphragm + sore ribs. Enhanced by the wonders of the killer tension headache - from the squrinched, tangled and jangled neck, jaw and shoulder muscles - brought on by coughing. Caused mostly by diving to previously unplumbed depths of stupid. Doc gave me a Rx for an inhaler because I couldn't get to sleep when I lay down in bed. So what do I do? Need to lie down in mid-afternoon. Do I use the inhaler first? Not a bit of it. Started coughing. Did I use the inhaler straight away? Nuh. 25 minutes of wracking coughs later, I finally managed to catch my breath enough to use the rotten thing. But now I couldn't lie down because my muscles were so sore. I need inhalers for a week or so once every five or six years. So why do I do this? Stupid gotta stupe, I s'pose. The cool thing about that possibility is that, since the Black Sea is "anoxic" in the deeper areas, preventing bacterial decomposition, there's a chance we could actually hope to find remains of the settlements that were inundated, if any were. Wouldn't be the first time an ancient culture arrived at a conclusion by misinterpreting a find. For example, belief in griffons likely arose from finding dinosaur bones that had the bodies of lions and the head of a bird. An ancient society could have found a boat on dry land and extrapolated the whole story from that. ....so it's not surprising the world has not found it. What evidence? Is there an archaeology dig or finding you can cite? Where is Mount Sinai? Hardly, Saudi Arabia is a muslim nation and it shares the same exodus story as the Jews and Christians. Ow. And this has nothing to do with the great flood, so shouldn't be here. Last edited by Lynx_Fox; July 30th, 2012 at 02:11 AM. What planet are you on ...of course there is scientific proof of a global flood. No, actually there is not. Do you have presentable proof otherwise? Do you have any proof that there wasn't a flood? of course you don't because all your studies and so called evidence is all conjecture. No it is not conjecture, there is a clear succession of fossil from the simplest to the most complex that corresponds to the oldest to youngest geologic strata. There also written records from Northern Africa and China that span the time frame asserted for the flood, Tree ring records that span that time frame and varve records that span that time frame. If you have evidence they are all wrong then please provide it. So my first question is where was that page plagiarized from? There a myriad of foot notes notations, but no footnotes or references to which they correspond. How is one supposed to check the accuracy of the assertions if the name of the original paper/publication the assertion was made is not given? plus the amazing lack of understanding of basic geology, and the information that is quoted in suggested support of a ~6000 year old global flood is rather painful. The evidence is all around you...monkeys are still monkeys and apes are still apes . That would be because humans (Homo sapiens) is a member of the Ape family (Homonidae) and we share a common ancestor with the modern great apes. evolutionary biologists and paleontologist do not say were evolved from the modern species. That is a meme that was stated during the Scopes trial. How do you explain the varves, tree rings, intact written records, and chronological sequence of fossils in the geologic record. Noah surely had the logistical nightmare of logistical nightmares attempting to cramp all those exotic land creatures into his arc. I can almost imagine an anxious Noah wipe sweat from bushy brow as he watches the Brachiosaurus place its first step onto the creaking boarding ramp! Actually, does anyone want to hazard a rough guess on how many football stadiums it would require to house all pairs of known land creatures that ever existed (including the extinct ones of course)? Not sure if we need complicate matters by including room for an aquarium to house the fresh water or salt water fish? If you do not understand these, perhaps you should stick to reading simple scientific literature. I read the truth..that's in the Bible. dickens he is right. You have so far done nothing but troll your religion and provided no credible science to support your position. Unless you do so, your time in this forum will be short--consider that a warning. The scientific fact is..... (to answer a question above)..... that all animal species two by two could fit into the ark. Doctors Morris and Whitcomb in their classic book,The Genesis Floodstate that no more than 35,000 individual animals needed to go on the ark. In his well documented book, Noah’s Ark: A Feasibility Study, John Woodmorappe suggests that far fewer animals would have been transported upon the ark. By pointing out that the word “specie” is not equivalent to the “created kinds” of the Genesis account, Woodmorappe credibly demonstrates that as few as 2,000 animals may have been required on the ark. To pad this number for error, he continues his study by showing that the ark could easily accommodate 16,000 animals. I think you must mean "my opinion is ..." as you haven't presented any science here. No this is not "scientific fact". It is poor conjecture based on very doggy tactics, such as "kinds", "mammals only", a complete lack of understanding of the fossil record, and a complete lack of understanding of the geologic record. To call this scientific fact it, quite bluntly, insulting. Addressing whether or not a set number of animals COULD fit onto a boat does not even begin to scratch the surface of all the other problems. How do you herd undomesticated wild animals (especially predators) onto a boat in twos? How do you maintain that boat? How do two of ANY animal reproduce a successful genetic line without inbred mutations that would destroy the species? Where does the food for all of these animals get stored (again especially for predators that require a fresh kill to feed)? EDIT: I really hate religious debate in scientific fields, but this thread seems to require it as we are asking for scientific evidence to back a biblical story so I will break my rule. Why is the Bible considered a valid scientific piece of evidence relating to the age of the world, yet a tested and proven process like carbon dating isn't good enough? I can't comprehend that. That being said; a lot in the book is actually damned good history and military tactics. And, if you understand anything about primarily pre-literate societies, speaking directly to someone about something was considered an insult to their intelligence. (not the best way to start a communication) so it becomes incumbent upon the reader to make the mental leap to understand what is being offered. If you ain't up for the task, don't waste your time. Last edited by sculptor; August 5th, 2012 at 09:35 PM. Firstly, I was not involved in the discussion until just now. I responded to one post which cited some very limited material as scientific fact. That was not an insult to me or my intelligence, it was an insult to the scientific process. Secondly, if you would be so kind as to define the correlation between "damned good history" and scientific evidence that the Ark was real, I'd be grateful. Clearly, I'm out of my league here. EDIT: You also failed to answer even one of the speculations I proposed about the logistics of creating such an Ark. Address a couple of the issues I put forth rather than just attack me directly and perhaps we can engage in something more civil that this current exchange. I had no intention of throwing out the entirely of the Bible simply on the basis that I don't believe the Ark story. I believe and\or will accept a great deal of the material. My only concern with the post was the methodology used to reach the conclusion of "scientific fact". I'm no expert on literature, but I do understand metaphorical teachings such as what is used in ancient writing (for instance, I don't think the message in the story of David and Goliath is that I should throw rocks at people bigger than me). Still, doesn't the idea that these things are often not intended literally support the idea that perhaps this shouldn't be a scientific endeavor? Maybe it was never intended to be accepted as a real event so much as a message that isn't being interpreted properly. Like I said, I don't like to cross my streams when it comes to religion and science, but I really wanted to hear from the person I quoted how a scientific thought process was used to get from a very grand tale to a scientific fact. Again, I strongly dislike combative posting so I'm not trying to argue as much as understand. I can come off a little strong sometimes, though, which has been made clear to me throughout my academic history of generally putting people off when we disagree. It's one of my many failings. I think Flick, and the vast majority of Christians, understand those concepts perfectly. It is a minority (I hope) of biblical literalists like "dickens" who are unable to understand the nature of storytelling. I disagree--most Christians I've run into get it right-- while Jesus obviously used metaphor and allegory in his numerous parable, the OT story are meant to be taken literately and in fact were taken seriously and literately until the past century or two as a tactic to duck from the obvious conflict with science. The major of Christian secondary literature shows this as well--Christian kids by parents, Sunday schools in during services the literal stories such as about the great flood, exodus etc; not taught it as a metaphor for something else. Why? It wasn't told from the position of NOAH, it was told from the position of god: "I establish my covenant with you: Never again will all life be destroyed by the waters of a flood; never again will there be a flood to destroy the earth. " Noah didn't collect the life either, as the story is told, the animals were organized by god and made that journal to the ship on their own. And it's still taught this way. It's obviously complete rubbish thoroughly disproved as impossible by science, engineering and other fields. I doubt it's ever told as an allegory or metaphor for something else, like the Jesus's parables are. there was a flood that took most of the low lying lands 400 odd generations ago at the end of the last glacial cycle. maybe, just maybe, after 300 odd generations of retelling the story, and added embellishments we are talking about a real event? How would you prove that though? and what is the relevance of it in context of the current status with a large segment of the fundamental Christian population as true exactly as told? While I admit I have shown interest regarding scientific endeavors related to the study of the famed biblical flood, I don't see how the leap is made to the Ark story. The life forms on our planet have shown incredible resilience to changes and life here has survived many global catastrophes without the need for a man in a boat to save it. This is all working on the assumption that there is enough water on this planet to even flood the Himalayas, which doesn't smack of science. Logically, it seems that just as modern populations tend to be prolific within a couple hundred feet above current sea levels, that must have held true circa 10-50,000 years ago, and now all those habitations (and cultural centers?) are underwater. And underwater archaeology is prohibitively expensive. and, as/re the fundamental biblical literalists, Why should I want to alter their perspective if they are comfortable with that perspective? Flick, I'm not a biblical literalist, but i do think most stories there had core events from which they have mutated into the present form. Always a gamble when trying to deconstruct a current story and find it's roots, or even an archaeological dig and understand what the artifacts have to say about their owners. Last edited by sculptor; August 7th, 2012 at 10:34 AM. This scientific comunity dismissed the theory straight away, some of his findings have been debunked. Some of the stuff in the book is very interesting. I don't know if anybody reading this knows more about these books and the evidence in them? Velikovski was a crackpot, and his ideas of collisions between planets has long been discredited. What he failed to realise is that astronomers can use computer models and maths, very well proven, to investigate all such ideas. When that happened, it took almost zero time to reveal that they were impossibilities. I fail to see how computor models and maths can absolutely rule out irregular activities in the history of the solar system. What possibilities do you foresee that cannot be modeled? Not forsee as we'r speaking about history. I would have thought things like collisions (iregular instances) in our solar systems evolution, as suggested in vehlikovsky's book, would be difficult to proove or dismiss using maths and computor models of the solar system.